In light of his lackluster Q1 fundraising, the MN-01 Republican congressional candidate endorsed by his party at the end of March stated that he thought national party leadership would come to his aid financially. A flurry of recent articles suggests that scenario could be growing increasingly unlikely. Shellshocked House Republicans got warnings from leaders past and present Tuesday: Your party’s message isn’t good enough to prevent disaster in November, and neither is the NRCC’s money. . . .
. . .And in a closed-door session at the Capitol, National Republican Congressional Committee Chairman Tom Cole (R-Okla.) told members that the NRCC doesn’t have enough cash to “save them” in November if they don’t raise enough money or run strong campaigns themselves. . . .
. . .Cole’s overall message was clear, said members who sat through the meeting: “If you’re not out doing your own work, and you’re waiting for the NRCC to come in at the last minute and save you, it ain’t gonna happen.” That’s how one lawmaker characterized Cole’s talk, adding that the NRCC is “not going to have the resources” to help all members “and Democrats will have a lot more money.” . . . If the NRCC can't help its endangered incumbent members who are unable to put together sufficient war chests, we can only wonder about pie-in-the-sky thinking on the part of a candidate who faces a primary battle with thousands of dollars less than his better known primary opponent. Neither Republican still standing had a cash on hand balance approaching $100,000 at the end of March, while Walz had $1 million in the bank and no debts. Seeking to put a spate of bad news behind them, House Republicans headed over to the White House on Wednesday morning, as members gathered for a rally with President Bush. . . .
. . ."It was a lovefest," said Rep. Steve LaTourette (R-Ohio) of the meeting with Bush. Bush was introduced by House Minority Leader John A. Boehner (R-Ohio) and then took questions from members for about 45 minutes, according to GOP aides. Given that George W. Bush is proving to be the most unpopular American president of modern times, we're hoping word of the bonding spreads from Preston to Pipestone, from Lake City to Luverne and all points in between. 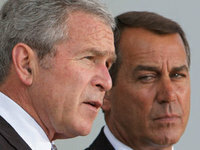 That nice picture of Boehner and Bush should help. Losses in two recent special elections combined with prospects for a tough contest next week sent House Republicans scrambling for change — both in words and deeds. Minority Leader John A. Boehner told his caucus behind closed doors Tuesday that Americans won’t vote for Republicans until they fix their “brand” and convince voters they will fix Washington, according to members who were present. An open question is whether that effort might also include changes at the National Republican Congressional Committee, which is led by Rep. Tom Cole of Oklahoma. Boehner has been unhappy with candidate recruitment and fundraising and angry about the embezzlement of funds by an insider. Earlier this year, the NRCC discovered unauthorized wire transfers and belatedly learned that audits had not been conducted on its accounts for several years. The committee ended 2006 with about $990,000 less than its balance sheet showed and ended 2007 with $740,000 less. The FBI is investigating. Meanwhile, incumbent members have resisted paying their dues to the committee, and many retiring members have been slow to offer to transfer their excess cash — both signs of a lack of faith that victory can be had in November. The trail of special-election defeats has fed discontent with the NRCC, the bluntest of which came from Newt Gingrich (1979-99), the former Speaker who helped win a Republican majority in 1994 for the first time in 40 years. . . .
Rochester Post Bulletin: MN-01 race shaping up to be "a dogfight"
GOP Rep. Gil Gutknecht and DFL challenger Tim Walz brought in a couple of political heavyweights on Sunday in the latest sign that the U.S. congressional race is shaping up to be a dogfight. Rep. John Murtha, a 16-term Pennsylvania Democrat and former Marine, stumped for Walz during a political rally at the home of a southwest Rochester couple. Meanwhile, former GOP Speaker of the House Newt Gingrich was the main attraction at a Gutknecht fundraiser in the Radisson Hotel in downtown Rochester. Their speeches and comments reflected the political divide over the four-year-old Iraq war and its relationship to the war on terrorism. They also underscored the issue's prominence in political races across the country, including Minnesota's 1st Congressional District, where the 12-year incumbent Gutknecht is fending off a challenge by political newcomer Walz. Regular readers of Bluestem Prairie have learned how important this issue is for people in the Fighting First, from the headlines generated by Gutknecht's wobbling on the issue to letters-to-the-editor in newspapers across the district. In Rochester, Murtha said the public was tired of what he called the Republican-controlled "rubber stamp Congress" and was eager for change. The rally was at the home of Sarah and John Pacchetti of southwest Rochester, the same couple who hosted Sen. John Kerry when he ran for president in 2004. "I see an intensity out there I have not seen for years. People want a change. They want somebody to speak up like Tim," Murtha said about Walz, who stood next to him on a porch overlooking a crowd of an estimated 60 people. Murtha catapulted to the national stage with his call for U.S. troops to leave Iraq. Murtha said American troops did a "marvelous" job in the early stages of the war, but were let down by political leaders who were wrong about Iraq possessing weapons of mass destruction and having connections to al-Qaida. The Bush administration also failed to adequately plan for the occupation, he said. He said that by any number of measures, the war in Iraq is a failed policy: Iraq produces less oil and electricity now than it did under Saddam Hussein and incidents of violence, much of it Iraqi-on-Iraqi attacks, have soared, while America spends $8 billion a month on the conflict. "I see no way that it can be won militarily. It's a police action. And we have to revert to diplomatic effort in a police action," Murtha said.
. . . he said a U.S. military withdrawal from Iraq would spell disaster for America and a bloodbath for Iraq. "My question would be: What signal does he think it sends to all our allies around the world who watch the United States abandon an ally and walk out as (Iraqis) get slaughtered, which they will," Gingrich said. "Gingrich said an American withdrawal would effectively turn the Persian Gulf over to an Iran desirous of nuclear weapons that "wants to defeat the United States and eliminate Israel from the face of the earth." While Democrats have argued that the war in Iraq has been a distraction from the war on terrorism, Gingrich says Iraq is part of a larger global threat. An anti-American coalition is emerging, composed of such countries as Iran, North Korea, Somalia, Syria and Venezuela. In an age of nuclear and biological weapons, America's response should be not to "stay the course," but to redesign the war and the country's strategy for the threats ahead, he said. "I believe if we mobilize now, that we still have a huge net advantage over our enemies. But if we wait and let them get nuclear weapons, and wait and let them get better organized, we're going to be potentially in a Third World War," he said. While the Iraq war has opened a political divide between Democrats and Republicans, it has tended to obscure tensions within each party. While Murtha has called for a military withdrawal from Iraq, Walz has not. Walz, a high school teacher and retired National Guard Command Sergeant Major, reiterated his call for "robust diplomacy" as a critical element in bringing the troops home. "I can tell you for certain the one plan that's not working is the Bush administration's plan. That one is a failure," Walz said. I would like to thank the Winona Daily News for its views on Gil Gutknecht’s bending of the truth on Wikipedia. No matter who tried to change the information that he supported a 12-year term limit and signed his name on the bottom of the 1995 Contract with America, whether it be a staffer or Gutknecht himself late at night at his home, the offense is the same. If Gutknecht takes enough time to, not once, but twice, try to change the facts, what else is he doing to alter truths that we as Minnesotans should know about? He signed a contract that said he would leave in 12 years so that he would not become a career politician and now wants to become just that. Well, that is not the only thing he lied about in the contract with America. He also promised to restore the faith and trust of the American people in their government. Sounds like Gutknecht needs to go back to auctioneering. The DCCC has a rundown of Gutknecht's current activities in the GOP Auction Barn. Apparently Team Gutknecht decided that editing Wikipedia wasn't such a great idea, and overhauled his campaign website instead. It now has even less content than before. Gone is the link in the issues section touting Republican accomplishments in the last Congress. Gone are links to photo album pictures of Presidential visits and Bush Farm and Ranch Team rallies. But Gil does have a new slogan: "Working on the things that matter most." Curious what that might be, we visited Gutknecht's issues section. Descriptions of his four issues are limited to one-paragraph squibs about agriculture, health savings accounts, prescription drugs and renewable energy. Iraq? Education? Immigration? Perhaps these issues don't matter most to Gutknecht's campaign strategists, but judging from the letters sections of MN-01 newspapers, the citizens of the district care enough about these concerns to let their neighbors know their concerns. Voters hoping to find substantive position papers on Iraq, education, immigration, health care, Washington reform, and other concerns should try the Walz campaign site. Other sharp contrasts abound. Gutknecht's media section contains only press releases and radio ads, while the Walz campaign site includes news coverage. At the Walz site, it's easy to locate an event or find out when the Rochester Chamber of Commerce forum is being shown on local television. At the Gutknecht site? Nada. Former Speaker of the House Newt Gingrich will appear Sunday at a fundraiser for U.S. Rep. Gil Gutknecht at the Radisson Hotel. The dinner is at 7 p.m., and the speeches are scheduled for 8 p.m. The dinner is $1000 per person. We suggest the more common sense alternative of the Veterans for Walz event at 4 pm. at the home of Home of Sarah and John Pacchetti, 930 8th Ave. SW, Rochester. Can't make it? Give to Tim Walz via Act Blue. So far, $10,726.27 in small contributions has been raised since Walz became an ActBlue Netroots candidate. Yup, that Al Franken sure can raise money and give it to DFL candidates like Tim Walz, the Strib reports for the third or fourth time. Here's Franken on campaigning with Walz in St. Peter. On the one hand there's GOP incumbent Gil Gutknecht who has invited his buddy Newt Gingrich to help him campaign for a promise-breaking, "chuck the Contract with America" out the window seventh term in Congress. On the other hand there's Democratic challenger Tim Walz who's appearing this weekend with Congressman John Murtha. Gutknecht/Gingrich versus Walz/Murtha. That's a clear contrast for Minnesotans come November on issues as diverse as the war in Iraq to fiscal responsibility to privatizing Social Security. The Wege has the bumpersticker for the Gingrich/Gutknecht fundraiser. . . .Last month, the House Intelligence Committee issued a report, according to its chairman, Rep. Peter Hoekstra of Michigan, "to help increase the American public's understanding of Iran as a threat." Claiming to be authoritative, the frightening report, however, bore the earmarks of a partisan political operation. A single Republican staff member (Frederick Fleitz, a former aide to John Bolton, now the hard-right ambassador to the United Nations) wrote the document without any input from or consultation with the Democrats. It painted a dire picture and blamed the usual suspects for complacency and worse: the CIA for inadequately assessing the threat and the International Atomic Energy Agency for complicity in "Iranian deception." In the run up to the Iraq war, the Bush administration tried unsuccessfully to oust IAEA director Mohammed ElBaradei for having stated with pinpoint accuracy that Saddam Hussein did not possess weapons of mass destruction and that Bush's case, moreover, was based on forged documents. This week, the IAEA responded with a counter-report debunking the Republican document as "outrageous and dishonest." "This is like prewar Iraq all over again," David Albright, a former nuclear inspector and president of the Institute for Science and International Security, was quoted in the Washington Post. The Bush White House needs a Republican Congress to protect and defend it for its radicalism to thrive. And congressional Republicans continue to stifle oversight, instead manipulating national security fears for political advantage. The closer the mid-term elections approach, the more desperate the tone. Johnson said the Youngers were surprised at how well Madelians took care of them after their capture, since it was common for crowds in the 1870s to lynch people who were captured after the kind of shootout they had with the posse. The Younger brothers were held in the Flanders Hotel on Main Street and were given clothes and food and were well-guarded. Johnson said the entire town came to see the Youngers, who regularly got visits from women. Former GOP Speaker of the House Newt Gingrich will appear Sunday at a fundraiser for U.S. Rep. Gil Gutknecht. The event starts at 6 p.m. at the Radisson Hotel in Rochester, 150 S.Broadway, with a dinner and a photo opportunity with Gutknecht and Gingrich costing $1,000 per person. Speeches are scheduled for 7:30 p.m.; the cost is $50 per person. Gingrich and Gutknecht go way back, ace-boonies from 1994, when Gutknecht was first elected in the GOP wave that took control of Congress that year. Gingrich is now nurturing Presidential ambitions after leaving Congress in disgrace; Gutknecht is trying to hold on to his seat. There's much more online about Gingrich. It's important to note that while the two agree on many issues, Gingrich and Gutknecht do have some major differences. During a 2006 CSPAN interview with Alvin Toffler, Gingrich referred to Wikipedia as a model of how people spontaneously organize information en masse and praised it for its accuracy and its being a "people's encyclopedia." Gingrich referred to it as being a model of future organization. On a more serious note, Gingrich has also been an outspoken critic of Pennsylvania Democrat John Murtha, who will be in Rochester on Sunday as well, at a Veterans for Walz fundraiser at 4 p.m. Detailed information here. Nor was Gingrich alone in attacking Murtha, as Taylor Marsh demonstrates at the Patriots Project in "The Swiftboating of John Murtha." More here at SourceWatch. Murtha's crime? Calling for redeployment of American troops in Iraq. Yet Gingrich's own position on Iraq has also evolved. See Even Gingrich wants to cut and run in the Carpetbagger Report from April, which references this ThinkProgress article "September 2004: Gingrich Blasts Critics of Iraq War Who ‘Complain We’re Not Winning Fast Enough’" Digby analyzed Newt's war planning in "Future Shock and Awe" back in 2003. Perhaps Gutknecht had Gingrich in mind in when he warned that it wasn't time to go wobbly on Iraq in June; maybe Gingrich's wobbling was on his mind later in the summer when Gil changed his own position on the Iraqi war. But now Iran is the new Iraqi, as one U.S. counterterrorism official recently told the press. And by bringing in Hoekstra and Gingrich, Gutknecht does appear to be allying himself with American neo-cons beating the war drums against Iran.